"La commedia" redirects here. For other uses, see Commedia (disambiguation). The work was originally simply titled Comedìa and the word Divina was added by Giovanni Boccaccio. 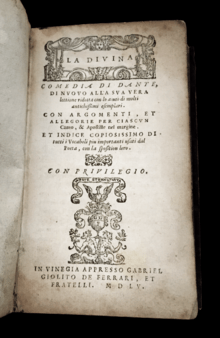 The first printed edition to add the word divina to the title was that of the Venetian humanist Lodovico Dolce, published in 1555 by Gabriele Giolito de' Ferrari. The Divine Comedy is composed of 14,233 lines that are divided into three canticas (Italian plural cantiche) – Inferno (Hell), Purgatorio (Purgatory), and Paradiso (Paradise) – each consisting of 33 cantos (Italian plural canti). An initial canto, serving as an introduction to the poem and generally considered to be part of the first cantica, brings the total number of cantos to 100. It is generally accepted, however, that the first two cantos serve as a unitary prologue to the entire epic, and that the opening two cantos of each cantica serve as prologues to each of the three canticas. 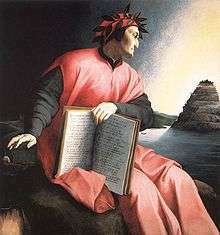 In central Italy's political struggle between Guelphs and Ghibellines, Dante was part of the Guelphs, who in general favored the Papacy over the Holy Roman Emperor. Florence's Guelphs split into factions around 1300: the White Guelphs and the Black Guelphs. 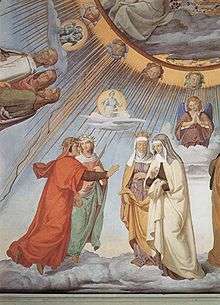 Dante was among the White Guelphs who were exiled in 1302 by the Lord-Mayor Cante de' Gabrielli di Gubbio, after troops under Charles of Valois entered the city, at the request of Pope Boniface VIII, who supported the Black Guelphs. This exile, which lasted the rest of Dante's life, shows its influence in many parts of the Comedy, from prophecies of Dante's exile to Dante's views of politics, to the eternal damnation of some of his opponents. The last word in each of the three canticas is stelle ("stars"). 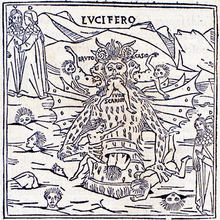 Allegorically, the Inferno represents the Christian soul seeing sin for what it really is, and the three beasts represent three types of sin: the self-indulgent, the violent, and the malicious. 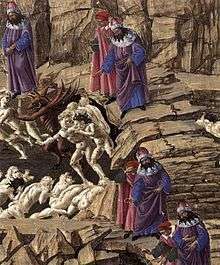 These three types of sin also provide the three main divisions of Dante's Hell: Upper Hell, outside the city of Dis, for the four sins of indulgence (lust, gluttony, avarice, anger); Circle 7 for the sins of violence; and Circles 8 and 9 for the sins of malice (fraud and treachery). Added to these are two unlike categories that are specifically spiritual: Limbo, in Circle 1, contains the virtuous pagans who were not sinful but were ignorant of Christ, and Circle 6 contains the heretics who contradicted the doctrine and confused the spirit of Christ. The circles number 9, with the addition of Satan completing the structure of 9 + 1 = 10. 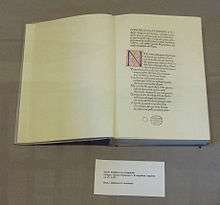 According to the Italian Dante Society, no original manuscript written by Dante has survived, although there are many manuscript copies from the 14th and 15th centuries – more than 825 are listed on their site. First printed edition, 11 April 1472. The structure of the poem, likewise, is quite complex, with mathematical and numerological patterns arching throughout the work, particularly threes and nines, which are related to the Trinity. 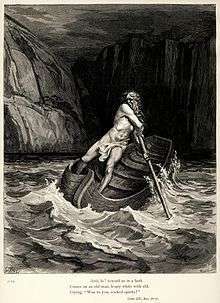 The poem is often lauded for its particularly human qualities: Dante's skillful delineation of the characters he encounters in Hell, Purgatory, and Paradise; his bitter denunciations of Florentine and Italian politics; and his powerful poetic imagination. Dante's use of real characters, according to Dorothy Sayers in her introduction to her translation of the Inferno, allows Dante the freedom of not having to involve the reader in description, and allows him to "[make] room in his poem for the discussion of a great many subjects of the utmost importance, thus widening its range and increasing its variety." 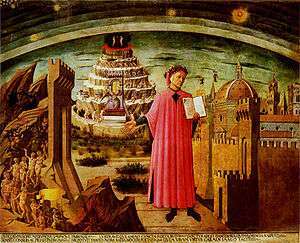 Dante called the poem "Comedy" (the adjective "Divine" was added later in the 16th century) because poems in the ancient world were classified as High ("Tragedy") or Low ("Comedy"). Low poems had happy endings and were written in everyday language, whereas High poems treated more serious matters and were written in an elevated style. Dante was one of the first in the Middle Ages to write of a serious subject, the Redemption of humanity, in the low and "vulgar" Italian language and not the Latin one might expect for such a serious topic. Boccaccio's account that an early version of the poem was begun by Dante in Latin is still controversial. Albert Ritter sketched the Comedy's geography from Dante's Cantos: Hell's entrance is near Florence with the circles descending to Earth's centre; sketch 5 reflects Canto 34's inversion as Dante passes down, and thereby up to Mount Purgatory's shores in the southern hemisphere, where he passes to the first sphere of Heaven at the top. In 1919, Miguel Asín Palacios, a Spanish scholar and a Catholic priest, published La Escatología musulmana en la Divina Comedia (Islamic Eschatology in the Divine Comedy), an account of parallels between early Islamic philosophy and the Divine Comedy. 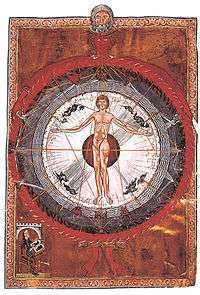 Palacios argued that Dante derived many features of and episodes about the hereafter from the spiritual writings of Ibn Arabi and from the Isra and Mi'raj or night journey of Muhammad to heaven. The latter is described in the Hadith and the Kitab al Miraj (translated into Latin in 1264 or shortly before as Liber Scalae Machometi, "The Book of Muhammad's Ladder"), and has significant similarities to the Paradiso, such as a sevenfold division of Paradise, although this is not unique to the Kitab al Miraj. Although this philosophical influence is generally acknowledged, many scholars have not been satisfied that Dante was influenced by the Kitab al Miraj. The 20th century Orientalist Francesco Gabrieli expressed skepticism regarding the claimed similarities, and the lack of evidence of a vehicle through which it could have been transmitted to Dante. Even so, while dismissing the probability of some influences posited in Palacios' work, Gabrieli conceded that it was "at least possible, if not probable, that Dante may have known the Liber scalae and have taken from it certain images and concepts of Muslim eschatology". Shortly before her death, the Italian philologist Maria Corti pointed out that, during his stay at the court of Alfonso X, Dante's mentor Brunetto Latini met Bonaventura de Siena, a Tuscan who had translated the Kitab al Miraj from Arabic into Latin. Corti speculates that Brunetto may have provided a copy of that work to Dante. René Guénon, a Sufi convert and scholar of Ibn Arabi, rejected in The Esoterism of Dante the theory of his influence (direct or indirect) on Dante. 1867 Henry Wadsworth Longfellow The first U.S. translation, raising American interest in the poem. It is still widely available, including online. ↑ See Lepschy, Laura; Lepschy, Giulio (1977). The Italian Language Today. or any other history of Italian language. ↑ Wilkins E.H The Prologue to the Divine Comedy Annual Report of the Dante Society, pp. 1–7. ↑ "Inferno, la Divina Commedia annotata e commentata da Tommaso Di Salvo, Zanichelli, Bologna, 1985". Abebooks.it. Retrieved 16 January 2010. ↑ Online sources include , , , "Archived copy". Archived from the original on 2 December 2009. Retrieved 1 December 2009. , , and Archived 4 March 2016 at the Wayback Machine. ↑ Dorothy L. Sayers, Purgatory, notes on page 75. ↑ Carlyle-Okey-Wicksteed, Divine Comedy, "Notes to Dante's Inferno"
↑ Inferno, Canto 34, lines 121–126. ↑ Dorothy L. Sayers, Purgatory, Introduction, pp. 65–67 (Penguin, 1955). ↑ Robin Kirkpatrick, Purgatorio, Introduction, p. xiv (Penguin, 2007). ↑ Carlyle-Oakey-Wickstead, Divine Comedy, "Notes on Dante's Purgatory. ↑ Dorothy L. Sayers, Paradise, notes on Canto XXXIII. ↑ "Elenco Codici". Danteonline.it. Retrieved 5 August 2009. ↑ Christopher Kleinhenz, Medieval Italy: An Encyclopedia, Volume 1, Routledge, 2004, ISBN 0-415-93930-5, p. 360. ↑ Dorothy L. Sayers, Hell, Introduction, p. 16 (Penguin, 1955). ↑ Boccaccio also quotes the initial triplet:"Ultima regna canam fluvido contermina mundo, / spiritibus quae lata patent, quae premia solvunt /pro meritis cuicumque suis". For translation and more, see Guyda Armstrong, Review of Giovanni Boccaccio. Life of Dante. J. G. Nichols, trans. London: Hesperus Press, 2002. ↑ Peri, Hiram (1955). "The Original Plan of the Divine Comedy". Journal of the Warburg and Courtauld Institutes. 18 (3/4): 189–210. doi:10.2307/750179. JSTOR 750179. ↑ Michael Caesar, Dante: The Critical Heritage, Routledge, 1995, pp 288, 383, 412, 631. ↑ Dorothy L. Sayers, Inferno, notes on page 284. ↑ Mtholyoke.edu "Mark Peterson Sheds New Light on Discovery by Galileo," College Street Journal, 8 March, 2002. Retrieved 2 April 2009. ↑ William Montgomery Watt and Pierre Cachia, A History of Islamic Spain, 2nd edition, Edinburgh University Press, 1996, pp. 125–126, ISBN 0-7486-0847-8. ↑ Dionisius A. Agius and Richard Hitchcock, The Arab Influence in Medieval Europe, Ithaca Press, 1996, p. 70, ISBN 0-86372-213-X. ↑ Kāmil Kīlānī and G. Brackenbury, Introduction to Risalat ul Ghufran: A Divine Comedy, 3rd ed, Al-Maaref Printing and Publishing House, 1943, p. 8. ↑ The theory "receives little credence", according to Watt and Cachia, p. 183. 1 2 Frederick Copleston (1950). A History of Philosophy, Volume 2. London: Continuum. p. 200. ↑ Guenon, René (1925). The Esoterism of Dante. ↑ Chaucer wrote in the Monk's Tale, "Redeth the grete poete of Ytaille / That highte Dant, for he kan al devyse / Fro point to point; nat o word wol he faille". ↑ Erich Auerbach,Dante: Poet of the Secular World. ISBN 0-226-03205-1. ↑ Irmscher, Christoph. Longfellow Redux. University of Illinois, 2008: 11. ISBN 978-0-252-03063-5. ↑ Seamus Heaney, "Envies and Identifications: Dante and the Modern Poet." The Poet's Dante: Twentieth-Century Responses. Ed. Peter S. Hawkins and Rachel Jacoff. New York: Farrar, 2001. 239–258. ↑ Marina Glazova, Mandelstam and Dante: The Divine Comedy in Mandelstam's poetry of the 1930s Studies in East European Thought, Volume 28, Number 4, November 1984. ↑ T. S. Eliot (1950) "Dante." Selected Essays, pp. 199–237. New York: Harcourt, Brace and Company. ↑ Jorge Luis Borges, "Selected Non-Fictions". Ed. Eliot Weinberger. Trans. Esther Allen et. al. New York: Viking, 1999. 303. ↑ A comprehensive listing and criticism, covering the period 1782–1966, of English translations of at least one of the three books (cantiche; singular: cantica) is given by Gilbert F. Cunningham, "The Divine comedy in English: a critical biography 1782–1966". 2 vols., Barnes & Noble, NY; esp. v.2 pp.5–9. ↑ Dante Alighieri. Bergin, Thomas G. trans. Divine Comedy. Grossman Publishers; 1st edition (1969) ASIN B001X6907Y. ↑ Le Normand-Romain, Antoinette (1999). Rodin:The Gates of Hell. Paris: Musée Rodin. ISBN 2-901428-69-X.